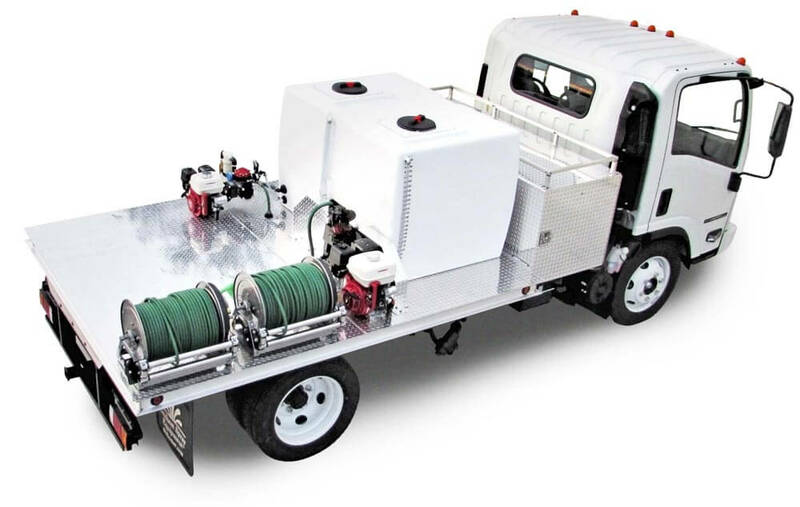 Think a high-quality, long-lasting spray rig is more expensive than a pickup truck and spray unit? The GSE Maverick will change your mind. 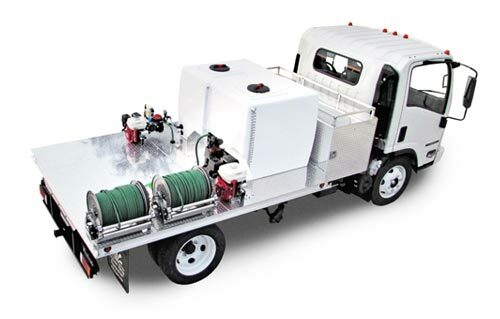 This 400-gallon split-tank rig actually costs less than a comparable pickup truck – but that’s not its only advantage. With a much tighter turning radius, the Maverick provides superior maneuverability. Its spacious bed also makes it easier to access and work with equipment when spraying and provides greater storage capacity. Better handling, better efficiency, better price – all with the longevity and performance Graham rigs are known for. Call us at 770.942.1617 to discuss additional Maverick options. 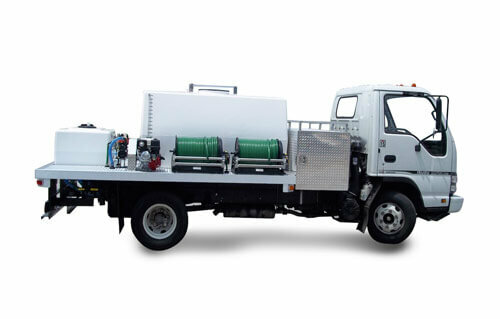 This spray equipment requires a 110” cab-to-axle Isuzu. To see some of the rigs that customers have designed with Graham’s help, visit our Photo Album page. And if you need quick tips for maintaining your spray equipment, visit our Videos page. There is a 3% surcharge on credit card purchases. Prices are subject to change without notice. The GSE mechanical agitation component is made specifically for your Graham skid sprayer. We deliver customer training on how to use and maintain the unit, as well as lifetime phone support. Throughout the years of service life, you can call us for assistance. 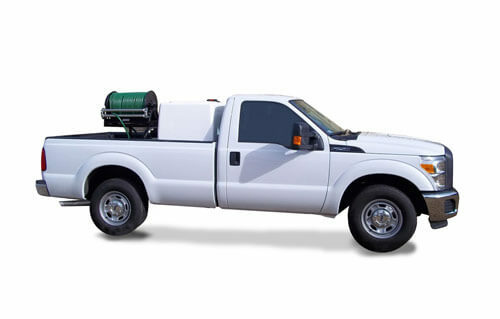 We sell parts for our lawn spray equipment and can usually talk you through a repair. 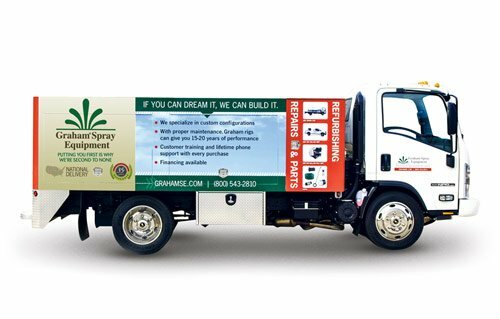 Graham Spray Equipment warrants new equipment of its own manufacture for 12 months against defective workmanship and materials under normal use and service. We offer financing to help you put your drivers onsite faster. Build time on units is an average of 2 to 3 weeks. Ride Along with a Lawn Care Company – Thinking about getting into lawn care? Here’s a great opportunity to see what it’s like. 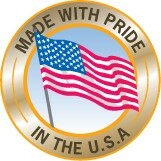 We’ll arrange for you to spend the day with a top-rated Atlanta lawn care company – and valued Graham customer. Give us a call and we’ll get the ball rolling.